Our Stork! The Fed-Ex guy thought I was nuts when I tore out of the house to meet him, THEN asked him for a picture! Shelby did the honors and dropped our acceptance package back via Fed-Ex! What a great big brother he is going to be! Where are we now? We are waiting for our Travel Approval (TA) to come from the CCAA. We're also waiting for my China visa to come back from the travel agent. Once our TA gets here, then our agency will request an appointment from the US Consulate in Guangzhou. The purpose of this appointment is to process our immigration paperwork and to issue Kaelie's immigrant visa (i.e., permission for her to come to the United States). Once the Consulate appointment is made, we will be making travel arrangements. We already know that I will be flying into Beijing for some sightseeing and also to get acclimated to the time change. Then, I will fly to Guangzhou for the remainder of the trip. Guangzhou is the provincial capital of Guangdong. 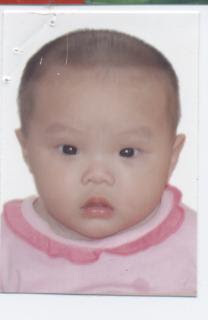 The orphanage director and nannies will bring Kaelie from Yangxi to Guangzhou, and this is where we will first meet each other and get to know one another while we process the adoption and also work on the immigration paperwork. I counted up, and there are only 5 more Saturdays until our tentative travel date. I am beyond excited! I'm looking forward to getting on that plane and starting this journey! 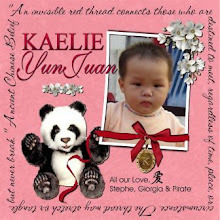 Ann at Red Thread China was able to get some updated pictures and measurements of Kaelie! I am so happy! Kaelie is so beautiful! She has four teeth now! Ann is sending Kaelie a care package which will go out in tomorrow's mail! Ann has had terrific service and I would highly recommend her! 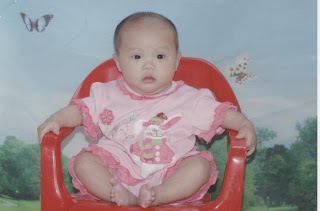 Also, my thanks to the orphanage staff and director for allowing the pictures to be taken and sending them on to Ann. What was I doing on Kaelie's birthday? Words cannot describe how appreciative I am to all of you for coming over and leaving a comment. I am in awe of the China adoption community and the bond that we share. I'm so thankful for all the Yangxi mamas who have left encouraging words of support and helpful suggestions. It's been so great to also meet several of my "new" travel buddies! I can't wait to meet all of you in person when we travel to adopt our daughters! If you are still waiting, I want you to know that you are in my thoughts and prayers. It's difficult to see others waiting for their daughters...I feel a twinge of guilt for feeling so happy and elated when I know many of you are still wondering, "When?" It sounds contrite, but the wait really does melt away during those first few hours and days after referral. 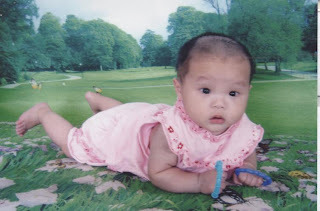 On July 4, 2008, she weighed 13 pounds and was almost 24 inches long. She is a deep sleeper. This is all we know at this time. We will receive our package tomorrow via FedEx. Thanks for hanging with us for all this time! I can't wait to hold Kaelie in my arms!